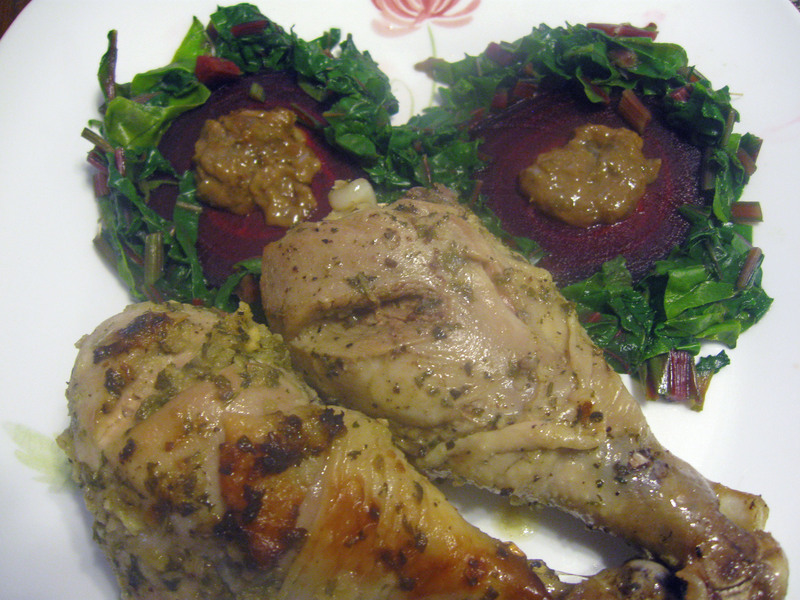 Lemon Herb Marinated Chicken and Roasted Beet Salad with Dijon Vinegarette | Albert Moyer, Jr.
Today, I decided to work with some new dishes for lunch. These two recipes come from the cookbook Creating Empty Bottle Moments by Clive Berkman. I must say that the chicken recipe is one of the best I have ever had, and the roasted beet salad is bursting with flavor. In fact, this is the first time I have ever eaten beet greens. They are delicious! This book not only covers food, but the love and meaning behind it. It is a cookbook like none I have ever experienced regarding food and life. It looks gorgeous… Thanks for sharing! Thank you! It was quite tasty and the first time I have ever actually used the beet greens. They are awesome!